Vladimir Lukin, Deputy Speaker of the State Duma from the Yabloko faction, said that after the signing of the Rome Declaration on the formation of the Russia-NATO Council, co-operation between the Russian Federation and members of the alliance will become closer and more intense. About 12,000 teachers in the Altai region kicked off a nationwide campaign Tuesday for education reform and higher wages, Interfax reported. Teachers unions in the western Siberian region are collecting signatures through Saturday for a petition to President Vladimir Putin. 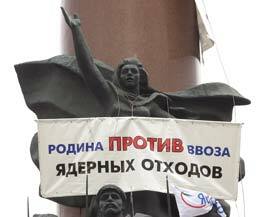 Other regions will join the drive, Interfax said. A large scandal is rising in the Duma again. Deputy Head of the YABLOKO faction Sergei The Union of Right-Wing Forces leader Boris Nemtsov has a new idea. He doesn't think that all democratic parties should support Vladimir Putin in the next presidential election. Instead, he believes that democrats should promote a single candidate, whose identity will be determined by the time of the parliamentary elections. Nemtsov is proposing an agreement among all democratic parties: "The candidate will be nominated by the party that wins the most Duma seats, and the remaining parties will accept him." According to Nemtsov, the agreement may be signed by the Union of Right-Wing Forces, Yabloko, and Liberal Russia. There is nothing like a good old-fashioned summit in the Kremlin between erstwhile superpower rivals, with a treaty on nuclear missiles thrown in for good measure, to get the pundits excited. Russia and the US will be doing everything possible to ensure that the May 23-26 summit between George W. Bush and Vladimir Putin looks good and sounds good. On the Russian side this will be a relatively easy task, since the government controls the national television channels from which the great majority of Russians will get their information about the meetings in Moscow and St Petersburg. The Risky Business of Waste Diposal. Russia's Nuclear Sewer. Since Vladimir Putin became President of Russia, the Kremlin has clashed frequently with a media company that exposed, among other things, the government`s handling of the war in A journalist was sent to prison for four years last year after filming the Russian navy dumping radioactive waste into the Sea of Japan. He, like many other Russians and environmental organisations, opposed the new laws that allow the privately profitable import of foreign nuclear waste. by our special correspondent Nathalie Melis. The leader of the Yabloko faction of the State Duma of the RF Grigory Yavlinsky thinks that the agreements reached during the Moscow summit of the US and the RF presidents "will open doors to Europe" for Russia. Grigory Yavlinsky, leader of the Yabloko faction of the State Duma of the Russian Federation, thinks that the fact that agreements signed during the Moscow summit of presidents of the RF and the USA Vladimir Putin and George Bush are subject to mandatory implementation represents "a victory of the Russian diplomacy". 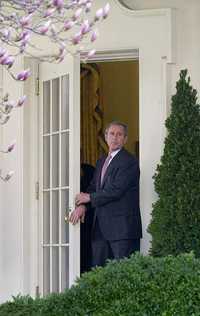 By Vladimir Isachenkov, The Associated Press, May 28, 2002. Worried about the apocalyptic prospect of international terrorists obtaining nuclear, chemical and biological weapons, U.S. and Russian officials and analysts met Monday to help draft possible new safeguards. Former U.S. Senator Sam Nunn and Richard Lugar, a U.S. senator from Indiana -- who together launched the decade-old U.S. effort to help contain the threat of weapons of mass destruction in the former Soviet Union -- described the threat of "catastrophic terrorism" as possibly the gravest challenge to global security. AFTER Sept. 11, there was an abrupt shift in Russia's foreign policy. Despite the course that was still being pursued last summer- symbolized by Korean leader Kim Jong Il's trip across Russia in an armored train - and in the face of the opinion of the so-called political elite, President Vladimir Putin unreservedly supported the United States in its fight with Osama bin Laden's terrorists and the Taliban. MOSCOW, May 24 [from RIA Novosti's Arina Dovgan] - Russian-US summiteers have signed a strategic offensive armaments reduction treaty. It came as a breakthrough for President Vladimir Putin, considering that a mere six months ago the USA was refusing to sign any documents at all, says Grigory Yavlinsky, prominent Russian politician and leader of Yabloko, a major reformist parliamentary group. The heads of the YABLOKO party think that today we are witnessing a "crisis in the leadership of the CPRF". On Wednesday the officials of the Ministry of Justice will grant the Yabloko party a certificate of registration. At the same time a months-long domestic reform of the organisation is coming to an end. A strong organisational structure has been established, and Grigory Yavlinsky thinks the party is now ready to fight for the electorate. The Ministry of Justice of the Russian Federation has registered the Russian Democratic Party YABLOKO as an all-Russia political party. Moscow. Deputy Justice Minister Yevgeni Sidorenko handed over the state registration certificate of the YABLOKO party to party Chairman Grigory Yavlinsky. The leader of the YABLOKO party Grigory Yavlinsky expects first and foremost a breakthrough in military and political issues during the summit meeting of Vladimir Putin and George Bush. The battle over the fate of Russia's largest non-governmental media conglomerate Media-Most-which was created and controlled by the former business "oligarch" Vladimir Gusinsky, who has been in Spain since last autumn-reached its climax in the first half of April. Since Vladimir Putin became President of Russia, the Kremlin has clashed frequently with a media company that exposed, among other things, the government`s handling of the war in Chechnya. A year later, though, the government is very close to winning the battle against its media critic. WASHINGTON - Thirteen days after Sept. 11 Russia's president, Vladimir Putin, met with 21 leaders from the Duma and the Presidium of the State Council to determine Russia's response to America's war on terror. Unlike with President Vladimir Putin's domestic policies, which are usually ascribed to one or another group of advisers within the corridors of power, the genesis of foreign policy is a murky affair. By Grigory Yavlinsky, The Moscow Times, May 22, 2002. After Sept. 11, there was an abrupt shift in Russia's foreign policy. Despite the course that was still being pursued last summer, symbolized by Kim Jong Il's trip across Russia in an armored train, and in the face of the opinion of the so-called political elite, President Vladimir Putin unreservedly supported the United States in its fight with Osama bin Laden's terrorists and the Taliban. The Moscow Times, May 22, 2002. MOSCOW (AP) -- The appeals board of the Supreme Court on Tuesday upheld an earlier decision blocking the import of nuclear waste from Hungary for storage in Russia. The Russian Democratic Party YABLOKO supports the treaty on a reduction in offensive weapons that has to be signed during the Russian-American summit in Moscow on May 23-26, 2002. MOSCOW - Despite nationalists' grumbling that Russia caved in to the United States to strike a nuclear arms deal set to be signed during this week's presidential summit, a senior lawmaker on Tuesday predicted its trouble-free ratification by the Russian parliament. MOSCOW (AP) - Russian Defense Minister Sergei Ivanov dismissed accusations Wednesday that Russia had compromised its national interests in agreeing to an arms control pact with the United States that slashes arsenals by two-thirds. 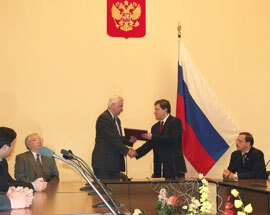 During the voting in the State Duma of the Russian Federation (on May 16, 2002) the Yabloko faction will support two out of seven draft laws "On Transactions with Agricultural Land" prepared by the Government of the Russian Federation and deputies of the Union of Right-Wing Forces (SPS) faction. The government is seeking money to raise wages for the military and state employees in the provinces. On May 15, Prime Minister Mikhail Kasyanov announced that the federal budget for 2002 would be revised, and unplanned expenditures would be covered through additional revenues. Duma deputies do not believe this and say that this is impossible to do without sequestration, at least a small amount for the time being. Moscow. During the voting on May 16, the Yabloko faction of the Russian Federation State Duma will support two out of seven draft laws "On the turnover of agricultural lands" drafted by the government and SPS faction deputies (the Union of Right-WingForces). Yabloko considers it a top priority to protect the title of citizens to their plots of land from official dictatorship. The faction will support the two aforementioned laws as they declare abolition of an anti-constitutional ban on the sale of agricultural lands. After September 11, 200, Russia's foreign policy abruptly changed. Despite the policy carried out in summer 2001, symbolised by Kim Chen Ir's travel by armoured train across Russia, despite the opinion of the so-called political elite, Vladimir Putin unreservedly supported the USA in their fight against Ben Laden's terrorists and the Taliban. On the 16th anniversary of the Chernobyl disaster a protest action against importing nuclear waste into Russia was held in 82 cities of 53 Russian regions. The action was organised by the Russian Democratic Party YABLOKO, different environmental and human rights organizations. According to preliminary estimates, about 30,000 activists participated in the action. Vice-Speaker of the State Duma Vladimir Lukin: "We should wait and see how Kiselyov's river will flow in Primakov's banks." Ekaterinburg, April 11. Deputy Chairman of the State Duma of the Russian Federation of the RF, member of the Yabloko faction, Vladimir Lukin said that he was glad that the TV6 team would be able to work again "under new banners". He made this statement at a press conference in Ekaterinburg, where he went to support the regional branch of YABLOKO at the elections to the Legislative Assembly in Sverdlovsk Region scheduled for April 14, 2002. However, according to Lukin, "we should wait and see how Kiselyov's river will flow in Primakov's banks." Meeting Against Imports of Spent Nuclear Fuel into Russia. MOSCOW - Russian President Vladimir Putin and U.S. President George W. Bush on Tuesday discussed their upcoming summit, trade issues and cooperation in international affairs including the regulation of regional conflicts, the Kremlin press service said. The authorities and the media continue vehement battles about alternative civil service, the terms of army service, and cancellation of student conscription deferral. The heaviest of the spring campaigns is under way, spring conscription. Military enlistment registration offices and the police are chasing young men who are avoiding their "sacred duty". Simultaneously, operations to round up deserters - those whom enlistment offices manage to force to don a uniform and take up an automatic weapon - are being carried out in different places. Now, these young men have something to fight with the authorities. The St. Petersburg Legislative Assembly was the scene of charges of political prosecution on Wednesday, following the Tuesday arrest of Union of Right Forces (SPS) lawmaker Alexei Kovalyov. The City Prosecutor's Office has charged Kovalyov with misappropriation of government funds, maintaining that he organized a kickback scheme to bilk the city budget of 2 billion rubles ($390,000) in 1996. Deputy Head of the Yabloko faction in the State Duma Sergei Ivanenko thinks that some "influential political forces" are testing out public opinion via different political structures, including that of the Duma, as they plan to make changes to the Constitution of the Russian Federation.